OK, listen up. If you have any type of herb garden, then put this recipe on the “to make” list, pronto. On my rooftop deck planter box, I happen to have beautiful basil, parsley, tarragon, and mint – more than I can use. I’ve already made and frozen multiple batches of tomato sauce infused with a lot of the basil and was trying to figure out what to do with the other herbs … then I spotted this recipe. I loved the Middle Eastern spices and the idea that egg slices would make this a filling, protein-laden meal. I gave half of this to my son Jake’s family, and they also had it for lunch and again for dinner – so I’m not the only one who likes this combo. It’s simple to prepare, really healthful and satisfying to boot. With all the fresh chopped herbs, what could be better? In a Nutribullet or small blender, combine everything for the dressing and emulsify. Taste and add more honey or salt as needed. Pour into a bottle or container and set aside until about an hour before you want to serve the salad. In a large mixing bowl, add all the salad ingredients except the eggs. The salad and dressing can be held separately for a day or two if you wish, or you can proceed. Give the dressing a quick shake and pour over the salad. Mix to combine. Add the sliced eggs, and mix gently again. Taste and adjust salt and pepper. Add a sprinkle more sumac to the top if you like. Set aside a few minutes before serving to allow flavors to permeate. The salad will keep in the fridge for a few days if you have any leftover, and this makes such a great lunch! 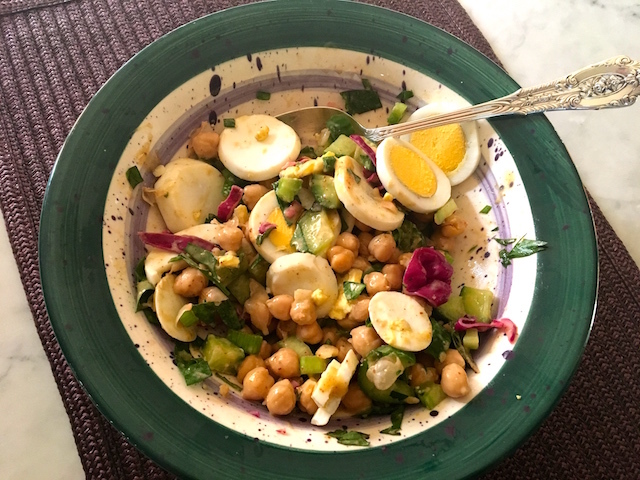 This entry was posted in Salads & Dressings and tagged Mediterranean Herb Chickpea Salad with Eggs. Bookmark the permalink. This sounds great, Marilyn, right down our alley, and I happen to have all the ingredients at hand right now. By the way, besides the usual Kirby ones, I made kosher dill pickles (without vinegar but with fresh dill flowers, using small Persian (~ Israeli) cucumbers this morning here in Santa Cruz, CA. I can’t wait to find out how they come out. Hope you like the finished dish-it is a good blend of flavors. Your pickles sound fab. Enjoy Santa Cruz and Happy 5779!